Model EPT motor slide bases provide motor anchorage and position adjustment for use with fan-motor sets having belt and sheave connected drive apparatus, when mounted on Kinetics Model EPT-L, EPT-H, EPT-SFB, or EPT-KFB equipment bases. Model EPT motor slide bases incorporate a single steel frame with four sliding motor anchor bolt, nut and washer assemblies, operate by one belt tension adjustment bolt, on tabulated base sizes up to 286, and two bolts for bases 324 through 445. 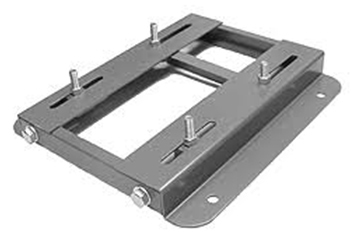 All motor slide bases have four anchor bolt holes for attachment to supporting equipment bases. Model EPT motor slide bases are superior to two-piece motor slide rails. Motor slide bases are more rigid than rail systems and assure that sliding motor anchor bolts are installed and remain parallel. Kinetics Model EPT motor slide bases are an accessory available for use with Model EPT-L, EPT-H, EPT-SFB, or EPT-KFB equipment bases. Model EPT motor slide bases are rigidly bolted to prelocated and fixed anchor bolts in equipment bases and provide a means of anchoring motors and adjusting belt tension in belt-sheave connected drive systems. Typical applications include use with fan-motor sets having NEMA or AMCA motor positions W, X, Y, or Z. Motor slide bases allow optimum motor adjustment for setting and adjusting belt tension to eliminate excessive belt and equipment bearing wear. Model EPT motor slide bases shall consist of a single frame steel motor mounting base and shall have four sliding motor anchor bolts, operated by one axis belt tension adjustment bolt, and shall have four anchor bolt holes for attachment to equipment support bases. Motor slide bases, to be supported by concrete or steel frame bases used as part of the noise and vibration isolation of the equipment, shall be furnished by the same manufacturer as the equipment support bases and shall be sized as required for motors to be mounted. 1- All motor slide bases are standard NEMA sizes. 2- Bases No. 56-286 have one adjustment bolt. 3- Bases No. 324-445 have two adjustment bolts.